TUCSON, AZ – The Tucson Roadrunners, proud American Hockey League affiliate of the Arizona Coyotes, will wrap up their current six-game home stand Saturday night with Phoenix Roadrunners Night presented by iHeartMedia. Faceoff is set for 7:05 p.m. at Tucson Arena. Upon entering the arena fans are encouraged to visit the limited-time Phoenix Roadrunners display case located in the breezeway of the Tucson Convention Center commemorating years of memorabilia dating back to the earliest of professional hockey days in the state of Arizona. Phoenix Roadrunners alumni including Michael Vukonich, Ed Kastelic, Shawn McCosh, Jeff Shevalier, Darryl Gilmour, Tim Watters and Sean Whyte will also be on hand to drop the ceremonial puck and will sign autographs for fans during the first intermission at the Cox Social Nest, also located in the breezeway. Donning specialty jerseys modeled after the historical International Hockey League days of the club worn from 1989-1997, the club will also auction off the sweaters postgame with a portion of the proceeds going to benefit The First Tee of Tucson. 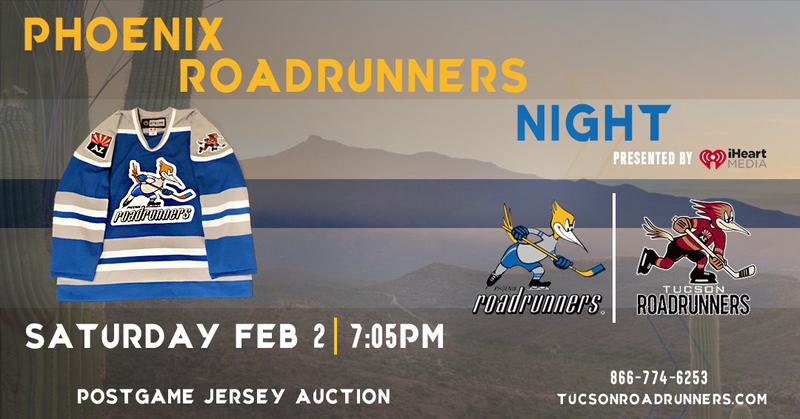 Just Sports, the official merchandise provider of the Tucson Roadrunners, will also be selling Phoenix Roadrunners apparel throughout the night. The evening will also feature a visit from Rocky, the original Phoenix Roadrunners mascot, who will team up with Dusty for a fun-filled night for fans of all ages. To purchase tickets for the evening, click HERE. The Phoenix Roadrunners began as Arizona’s first professional hockey team as members of the Western Hockey League from 1967-1974. The club played its games at the Arizona Veterans Memorial Coliseum until the ECHL-era, which played at Talking Stick Resort Arena. The 1972-73 and 1973-74 teams both won the Lester Patrick Cup as champions of the WHL. Roadrunners Assistant Coach John Slaney played for the Phoenix Roadrunners during the 1996-1997 IHL season. Robbie Ftorek, head coach of the Roadrunners ECHL affiliate, the Norfolk Admirals, was a star for the Phoenix Roadrunners from 1974-1977, finishing in the top three all-time in club games played, goals, assists and points. Ftorek was also named the Most Valuable Player of the WHA during the 1976-77 Roadrunners season. Saturday is also First Responders Night as we honor our local heroes for the services. For more information on First Responders Night, click HERE. The third round selection (#63 overall) in the 2015 NHL Draft by the Arizona Coyotes also assisted the AHL’s Western Conference to victory in the All-Star Skills Competition Sunday night by picking up a win for his team in the Inglasco Puck Control Relay and scoring in the MGM Springfield Breakaway Relay.